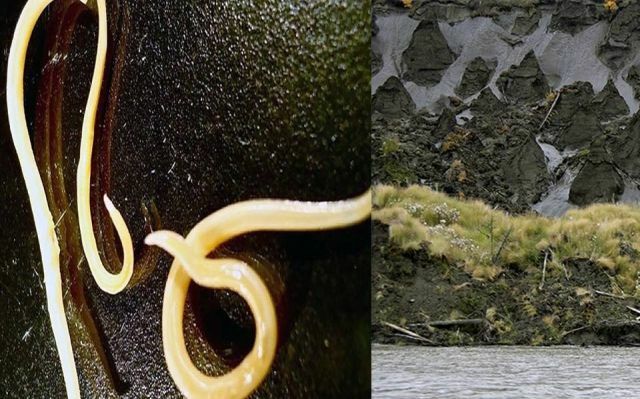 After being defrosted, worms “nematodes” frozen in permafrost for up to 42,000 years showed signs of life, they started moving an eating since the Pleistocene said a report from Yakutia, the area were the worms were found. We have obtained the first data demonstrating the capability of multicellular organisms for longerterm cyrobiosis in permafrost desposits of the arctic; states a report from Russian scientist from our institutions in collaboration with Princetown University. Some 300 prehistoric worms were analyzed and two were shown to contain viablenematodes. One worm came from an ancient squirrel burrow in a permafrost wall of the Duvanny Yar outcrop in the lower reaches of the Kolyma River – close to the site of Pleistocene Park which is seeking to recreate the Arctic habitat of the extinct woolly mammoth.This is around 32,000 years old. Credit image: Siberiantimes – Image left variable nematodes. Currently the nematodes are the oldest living animals on the planet. They are both believed to be female. The worms came back to life in a laboratory at the Institute of Physico-Chemical and Biological Problems of Soil Science in Moscow. Our data demonstrate the ability of multicellular organisms to survive long-term (tens of thousands of years) crybiosis under the conditions of natural cryoconservation, scientists said to siberiantimes.